“Three options come to mind: deep water, mulch or do nothing,” said Tietje. Below, he and Steven Swain, UCANR Cooperative Extension environmental horticulture advisor for Marin and Sonoma counties, discuss the advantages and disadvantages of each option. Q: Should oak trees be watered? 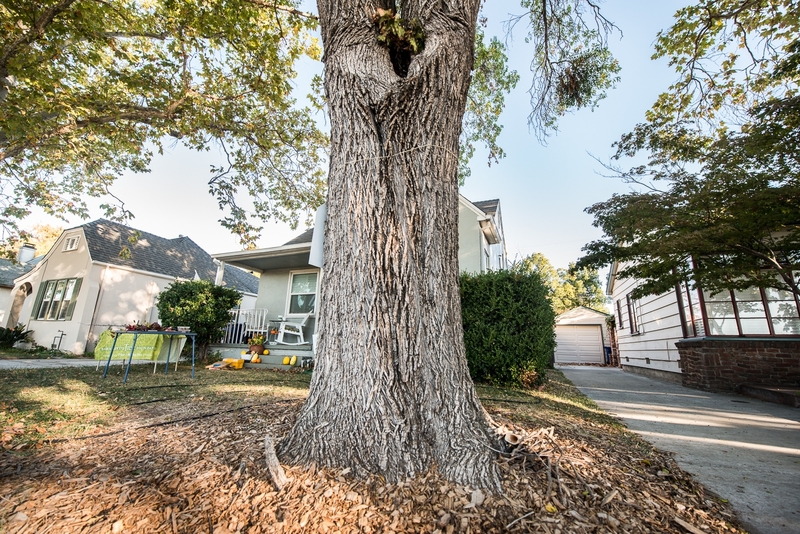 If the soil under your oak 12 to 18 inches down is dry and crumbly, the oak is out of water. A deep watering will invigorate the drought-stressed tree. Perhaps it seems ill-advised to water an oak tree during a drought. But think about it a minute. If you lose the oak, you lose substantial aesthetic and property values. Also lost are the many ecosystem services provided by this “keystone” structure, such as shade, soil nutrients, wildlife habitat and biodiversity. These take a very long time to replace. Q: How do I deep water? Deep watering of the drought-stressed tree is accomplished by moving a hose under the canopy of the tree during the day for one or two days at a low flow or trickle, such that the water percolates into the soil. Do this once or twice during the summer to early fall with at least a month between watering to allow the soil to dry, reducing the likelihood that fungi will attack the tree roots. Most any plant-based, commercially available mulch will work. A prudent approach to the current drought and the maintenance of tree health is to conserve existing soil moisture as much as possible. Mulching under the tree helps to control moisture by keeping the soil cool and suppressing weed growth. Mulching also adds valuable soil microorganisms. Q: Does mulch need to be composed exclusively of oak leaves and twigs? A: No—Although the best mulch is the oak's natural leaf litter, other plant-based mulches can provide a similar benefit. In fact, there may be some advantages to having other plant components in the mulch. Q: Can commercially available mulch provide the benefits of natural oak mulch? A: Yes—Most any plant-based, commercially available mulch should be fine, especially mulches that are derived from multiple sources, such as municipal green-waste that has been composted. Composting allows some of the more reactive compounds that may be present in the mulch to be broken down by heat, chemical and biological means. 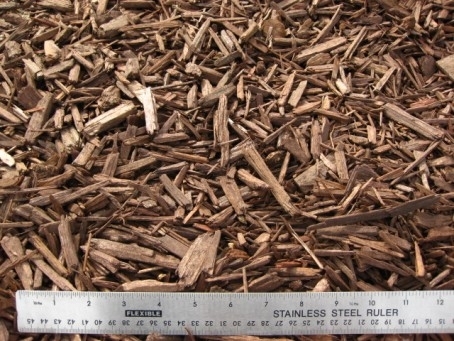 There isn't necessarily a problem with using a single-source mulch (e.g., grape pressings, nitrolized sawdust [nitrolization allows nitrogen to remain available to the plant]), but because single-source mulches lack the variety of densities, chip sizes and nutrient compositions typically found in multiple-sourced mulches, there is a somewhat greater risk of problems using single-source mulches. Commercial compost may be listed as green-waste compost. The best recipe is 1 to 2 inches of compost overlain with 2 inches of coarsely chopped fir, redwood bark or wood, totaling 3 to 4 inches of mulch. Cover the area under the tree canopy at least up to the drip line. Don't mound the mulch against the tree trunk. Q: Should mulch be mixed into the soil? Organic matter breaks down over time, and in the process causes the soils in which it has been mixed to eventually shrink in volume. This is fine in some instances, but it can spell disaster if one has incorporated mulch into soils that were placed beneath sapling trees, for instance. In this case, the soil under the tree will shrink in volume, and the tree will sink into the soil. Water then pools around the base of the tree, and the tree eventually develops root rot. Because mulches are incorporated naturally into soils by earthworms, springtails, and microorganisms, the benefits of digging mulches into the soil are pretty much balanced by the liabilities. In short, save yourself the work. Put the mulches on the ground and let the earthworms do the work for you. Q: Is there any mulch that is categorically unacceptable? A: Common sense should prevail—Coarsely chopped bark, wood and leaves is probably the best composition for a mulch, and that same material composted is about as ideal as one can get. The very best are oak leaf mulches, which exist, but are quite pricey and are typically derived by stripping wild oaks of their natural mulch base. Even less-than-ideal source material, such as eucalyptus leaves or black walnut roots, can be safely used if properly composted. Q: If oak trimmings and dead leaf fall from native oak trees are used for mulch, is the presence of termites or the spreading of oak bark beetles a concern? A: No—Termites do not live (for long) in wood chips. They require contiguous, solid wood to form colonies. The spread of termites in wood chips, or even in small branches, is therefore a non-issue. Every spring, summer and fall, oak bark beetles actively hunt stressed oak trees in central coast woodlands, and will find them from miles away. Worrying about spreading any of the various bark beetles that can attack oaks is a little like worrying about getting salt spray at the beach. They've been here for millions of years before us, and they'll likely be here millions of years after we're gone. That said, you may not want to encourage large colonies in your back yard by, for example, stockpiling large amounts of beetle infested firewood right beneath an oak tree. If your tree appears healthy, with dense and green leaves over at least most of the canopy, it could be best to do nothing. In other words, “If it isn't broken, don't fix it.” Give proper considerations for the use of water during the current severe drought, and mandatory water-use restrictions, and deep water only if the tree shows symptoms of severe stress. On the Central Coast, the predominant native oak trees are valley oak and blue oak, which drop their leaves in the winter, and the evergreen coastal live oak. Keep in mind that the two deciduous oaks, blue oak and valley oak, can respond to drought by undergoing leaf browning and leaf fall as early as July. This is a natural mechanism that the tree has evolved for water conservation. The tree is not dead and should be fine. All else considered, mulching that includes a green waste compost as described above could well be the most appropriate solution. Mulch conserves water as opposed to using water for deep watering, and mulching can improve important soil properties. For more information, visit the UC Cooperative Extension San Luis Obispo County website http://cesanluisobispo.ucanr.edu and the UCANR oak woodland management website http://ucanr.edu/sites/oak_range. This article on oaks in the drought is terrific! I am currently editor of the PVFA Turnout, a newsletter sent to residents living in the Pioneer Volunteer Fire Protection District, El Dorado County. The article on oaks would be very useful in this area. Can we include your article in our June issue? If so, how do you want to be credited? You are welcome to use the oak article. You can say it first appeared in the UC Agriculture and Natural Resources Green Blog http://ucanr.edu/Green. If you need a name, I’m the one who wrote it. Thanks for sharing our information with people in El Dorado County! I am on the board of Ojai Trees, a non-profit in the Ojai Valley concerned with preserving the tree canopy here. I would like to use a great deal of your article (crediting you, of course) in an article I would like to submit to our local paper, the Ojai Valley News. May I have your permission? You are welcome to use this article as a source for your article for Ojai Valley News. My husband and I just bought a neglected 7.25 acres of oak trees in Solano County. We have been cleaning up decades of fallen branches and trees. The larger trunks will be firewood, but the twigs, branches and rotten pieces we would like to put through a wood chipper and use as mulch rather than hauling it to the dump. One of our neighbors has apparently been weed whacking part of our property, so the ground under some of the oak trees is "bare naked" of fallen leaves, etc. Darn near bare dirt. We thought we could used our oak debris as mulch but the article mostly mentions leaves, not twigs, etc. From UC Cooperative Extension advisor Steve Swain and specialist Bill Tietje: The short answer to Joanne Jackson's question is that applying the chipped material is fine and will help to conserve soil moisture. If the homeowner just wants mulch (which is what it sounds like from the email), the chips will do fine going straight from the chipper onto the ground. Adding freshly composted material to the mixture would not hurt, and it might even help to increase desirable microorganisms in the soil and the moisture-holding capacity of the soil. However, it’s not necessary to add commercial mulch to the chipped material. Moreover, because the material the homeowner is considering using came from their own back yard, it is unlikely that any diseases will be transmitted by moving the chipped material. Therefore, the threat of imported diseases is NOT a serious consideration. Our advice would be to simply chip and apply what they have. Great article! I board horses at a property where we can't do deep watering. The oaks are very stressed, and I've taken a few gallons of water from the tap in our home and lugged it to the barn to water a few of the oaks. I can't obviously do much this way, but the ground is so dry that it soaks in instantly. I figure that a few gallons a week at the base of a tree is better than nothing. Is that true? And, I don't want to cause any rot. Any idea about the best way to do this, and how often? Thank you!